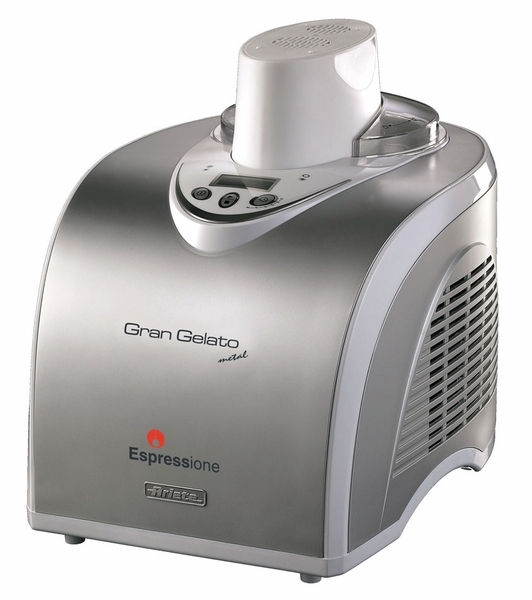 Espressione Gran Gelato Metal Ice Cream Maker allows you to make delicious and healthy sorbet, ice cream, gelato and frozen yogurts in the convenience of your home or office kitchen. The beautiful and efficient Espressione Gran Gelato Metal Ice Cream Maker is both compact and stylish with unique features to make the process simple and effective. The auto-refrigerant feature allows you to prepare it all with perfect consistency in record time, 1 liter in less than 40 minutes. Has a built in compressor with ozone safe R134A refrigerant. Thanks to this compressor, which can reach temperatures up to - 35 degrees, you can prepare different tastes in sequence. Comes with everything to make the process easy, enjoyable and successful, equipped with a removable basket for convenience, measuring cup and spoon to scoop ice cream. The digital LCD display indicates the temperature and the time remaining. Efficient and powerful operation in a beautiful design – metallic silver color.